We discussed the difference between day and night. We talked about why we only do certain things during the and the reasons we dont do alot of things after dark. We learned the world spins on it axis and turns once to make day time and night time. We had a sun the earth and a moon. When the part of the earth was looking at the sun, and the sun's light was shining on the earth it is day time and the part of the world the sun can not see is in darkness, it is night time. Some of the earth has day time and some of the earth has night time. 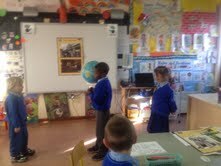 We learned when it is day time in Ireland, it is night time the other side of the world in Australia.